Are You Producing Media Clutter or Sharing your Knowledge and Expertise? More and more this concept is becoming so clear to me as I am approached almost daily about producing a promotional video for my ‘XYZ company’. I start to tell to explain a paradym change of our times that you could aptly refer to as ‘media clutter’. 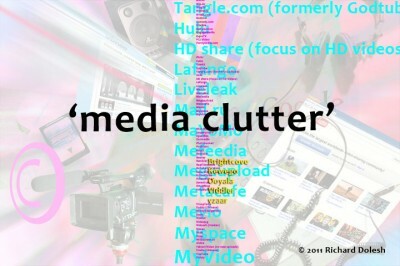 So what really is ‘Media Clutter’? It is stuff you don’t want, the corporate jargon that goes on and on ‘blah blah blah….” It’s the oil company saying “Everything is being done to plug the leak” when in reality, that’s far from the truth. It’s the corporate half truths generated to protect profits and public image. Basically, It is not the good stuff’ your looking for and most often it’s not the full truth! Ever since the beginning of cable television and the proliferation of ‘niche’ channels, our world has been steadily moving in the direction of ‘Media Clutter’. Hundreds of commercial tv channels are available today, as well as dozens of video sharing sites with no sight of slowing of growth. Electronic media has quite literally exploded, so much so, it’s revolutionized our media landscape, and proof of that is the number of dwindling newspapers and magazines. The availability and affordability of camcorders, computers keep plummeting and the ease of use of producing video content keeps improving…In fact today, one can shoot and edit a simple promotional video on a iphone that would be better than what a pro could produce in the 1980s even with a dedicated video camera, and a whole room of professional equipment. How about ‘broadcasting’ that video you just shot on your iphone? Youtube has got you covered….as well as billions of others. Ah, now we are starting to see the problem. Small laptops, netbooks, smart phones, iPads, tablets, and even smart ebook readers…on and on the list goes….Never has it been so easy to produce and get ‘to media’ but never has it been so hard to get to good, useful, helpful or meaningful content…but those smart enough to see the media clutter and all these major changes are smart enough to realize the consumer now has total control of the content they watch. And how do you get them to watch? Simple, it’s time to start producing truly useful, educational, and all around meaningul quality content. Forget the coporate ‘blah, blah, blah’! start doing things differently than you’ve always done them. …and you will be blessed in the process, by blessing others. Don’t give in to your fears of giving away your secrets. It’s probably impossible to share all the trade knowledge you may have, so that alone should help calm your fears! And don’t be afraid to be creative! This entry was posted in Production by Richard. Bookmark the permalink.